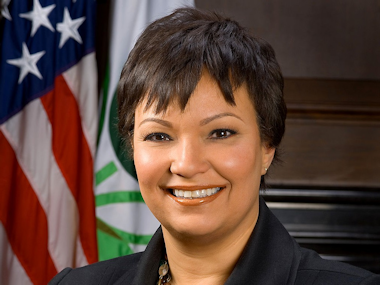 Lisa Jackson, former head of the U.S. Environmental Protection Agency, is joining Apple. Apple CEO Tim Cook announced the new hire in a conversation with Walt Mossberg and Kara Swisher at the D: All Things Digital conference on Tuesday. Jackson will be “coordinating a lot of [environmental practices] activity across the company,” Cook said. Jackson left the EPA at the end of 2012, after a four-year term in office, aiming to enact large-scale changes to address climate change and other problems with the environment on a national and global level. But Jackson’s tenure was cut short as she stepped down amid a secretive email scandal, in which she admitted to conducting official private EPA business under a false email alias. Jackson will ostensibly help Apple in dealing with the company’s effects on the environment in its manufacturing and product practices, an area of intense scrutiny for the company in recent years. “When you are large, if somebody is looking at something, you are going to be caught up in some way,” Cook said. But Cook said he doesn’t even mind being held to a higher standard. He noted that Apple owns the largest solar farm and largest fuel cells of any non-energy company. “We all hold ourselves to high standards,” Cook said.